Does that little white tag bearing the words “Dry Clean Only” strike fear into your heart? Dry cleaning can preserve your closet’s most beloved inhabitants, but it can also, ahem, take you to the cleaners. We’ll let you in on some tips that will help save your wardrobe—and your wallet, too. Read on for squeaky clean tips on dry cleaning your clothes! The dry cleaning process uses non-water-based solvents, liquids in which chemicals are dissolved, to break down dirt. Stubborn stains are pre-treated with steam jets or additional chemicals prior to dry cleaning. Clothes are then washed and rinsed with solvent for short bursts of time. A quick tumble with warm air dries items without heat damage, and a deodorizing blast of cool air eliminates that chemical-y smell. Because these solvents can weaken fabric over time, and because the process involves friction, dry cleaning can be rough on your wardrobe essentials. Be choosy about your trips to the cleaner – we’ll show you how below! Dry clean every 3 to 4 wears. Dry clean every 2 to 5 wears (depending on how sweaty you tend to get). Dry clean every 5 wears. Dry clean once a season. Dry clean every 1 to 2 wears. Blouses get up close and personal against your skin, and delicate, dry-clean-only fabrics like silk tend to absorb sweat. You can get away with dry cleaning button-downs once every three or four wears, though you may need to up the frequency during warm summer months. Silk blouses will likely need to go to the cleaner every one or two wears. Stylist Tip: Try layering a cotton cami underneath your tops as a barrier to perspiration to extend time between dry cleanings. Toss the camisoles in the wash after each wear. Your favorite wool sweater can last three to five wears before a deep cleaning. A waxy coating on wool fibers creates a barrier against liquids, preventing them from being absorbed and staining. Static, which attracts dirt and dust, is also repelled by this coating. Cashmere, wool’s more fragile cousin, will need a lot more TLC; you may need to take in a cashmere sweater every two wears. 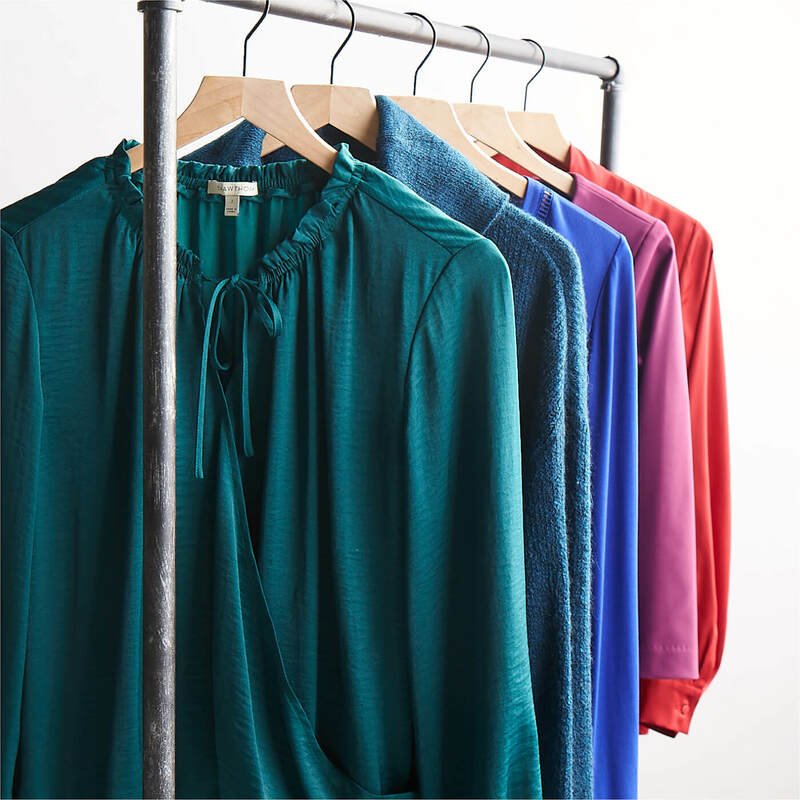 Stylist Tip: Store sweaters folded or rolled in airtight bins in the warmer months. This will prevent them from absorbing any musty smells, smoke or pungent food odors during their off season. Because dress pants and skirts are typically made of heartier fabrics, they won’t wrinkle or crease as frequently. If your favorites are made of wool, you’re in luck–as mentioned above, it resists stains! Unless you’ve got a ketchup smear looming large, take your pants and skirts to the cleaners every five wears or so. Since jackets and coats don’t come into direct contact with your skin, it’s a safe bet that you’ll only need to dry clean them once per season. A blazer is a different animal, as you likely wear it more often and for longer periods of time. Check its fabrication; if it’s wool, you can go longer between cleanings, but other fabrics like polyester, viscose or rayon may need a refresh every two to three wears. Evening dresses are the high maintenance queens of the fashion world. You want your favorite sleek LBD to look fresh and brand new with each wear, so you’re going to have to treat it with kid gloves (and, well, heavy duty cleaning solvents). Relinquish your dresses to the dry cleaner every one or two wears. Remove the clear bag before reinstating your freshly cleaned clothes into your closet, as humidity or any remaining moisture from the steaming process can get trapped in the plastic and foster mildew. Fold items like sweaters or pants so they won’t wrinkle. Recycle wire hangers from the cleaners – the edges can create shoulder dimples and wrinkles in delicate fabrics. For blouses, utilize curved fabric or velvet hangers instead. Heavy outerwear will stay put on sturdy wooden hangers. Got dry cleaning tips to share? Let us know in the comments below!